On meeting the musical demands of projects as diverse as Alex Gibney's profile of Elizabeth Holmes and a Peter Sarsgaard drama and hitting all the octaves in between. If it’s been Alex Gibney’s job over the years as a documentarian to keep his ear to ground and spot the things that are out of sync, it’s been left to his composer Will Bates to find the right rhythm for it, no matter where it leads. If anyone’s game for exploration, it would seem to be Bates, co-founder of the groundbreaking recording studio Fall on Your Sword in New York where the ability to be the answer for all musical needs for artists in all mediums, whether it was film or art installations, has extended into his versatility as a composer. 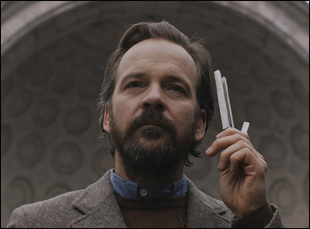 Able to accommodate projects of all sizes in a practical sense, Bates has been able to adjust musically in a creative sense to any film or television show that’s been thrown his way as well, displaying a spirit of adventurousness that has made his work singular even when the projects have been varied. Nowhere was this more evident than this past Sundance Film Festival in which Bates had two films in Park City — Gibney’s “The Inventor: Out for Blood in Silicon Valley,” where the composer’s propulsive score reflects the ambition of Theranos founder Elizabeth Holmes, while the slight sadness around the notes mirrors the fact that her revolutionary blood tests were too good to be true, and Michael Tyburski’s “The Sound of Silence,” a drama starring Peter Sarsgaard as Peter, a professional sound tuner for people’s homes, giving customers a good night’s sleep in the heart of Manhattan. Naturally in the latter, Peter’s aural sensitivity lends itself to an intense sonic experience that Bates makes the most out of, creating fragmented sounds that linger in the air with its main character seemingly trying to pull them all together into some kind of harmony. As a composer for the likes of Ry Russo-Young (“Nobody Walks”), Matt Ross (“28 Hotel Rooms”) and Mike Cahill (“I Origins”), these kind of deconstructions have led to new ideas about what a musical score can be, often in tune with the scattered thoughts of a narrative’s characters more than the narrative itself before reaching a moment of epiphany in which the character’s revelation is matched by the audience’s with how inventively Bates makes it all coalesce. In fact, it may be the same feeling Bates himself once experienced while playing a residency in Brooklyn and decided to put images up behind him to accompany the “Flash Gordon”-inspired songs (from which his recording studio takes its name) he was playing. On the eve of the premiere of “The Inventor” on HBO and the release of “Sound of Silence” still on the horizon, he spoke about how he got into composing, his longtime collaboration with Gibney as well as his first with Tyburski, and moving between scoring for film and television. How did you and Alex first meet? The first movie we did together was a movie called “We Steal Secrets” about Julian Assange and Wikileaks and that was an introduction from his editor, Sloan Klevin, who I had done some work in the past and she introduced me to Alex and we just kind of hit it off straight away and we did that movie and then I think pretty much every project that he’s done since then. We’ve done a few TV projects together. We’ve done about five or six films and yeah, he’s awesome. I guess I just love working with him and he’s so music-driven and the work he does is so cinematic and we really kind of get under the hood with every project and get detailed and it’s important to us that every film has its own identity and his films are so character-driven that I feel it’s always a great opportunity for scenes and unusual instrumentation. What were the early conversations about for “The Inventor”? 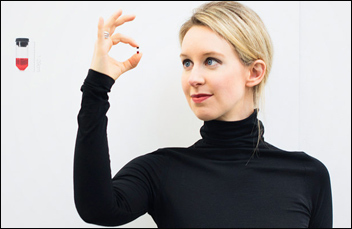 [Elizabeth Holmes] is such a conflicted character, so there was a very delicate balance tonally in trying to figure out her theme and her sense of morality. We always had to be quite careful about things getting too dark or too sinister and trying to make the point that the movie does that she was, at least at first, trying to do something noble and as things get darker, I feel like Alex talks about [giving the film a] haunted house feel, like he wanted a magical realism darkness to the company as things began to spiral out of control, so despite everything that happened, there was this backbone of ideology was to do something good and then obviously it went nuts. Since you’ve been working with Alex for a while, how early do the conversations start on a project? He will tell me about a project pretty early on while they’re still assembling material and maybe the edit is halfway done. I try to get on as early as possible, [because] these movies are really brought to life in the edit, so to have my music in there early is essential. We can help to guide themes and tell the story, so when the music can inform the edit, that’s a great place to be. With this one, they were a little bit more locked than some of the other ones. For example with “We Steal Secrets,” we weren’t even locked when we were in the mix because there was like one final interview [Alex] was trying to get and these movies tend to stay pretty fluid until the last minute. But I was writing themes for [“The Inventor”] while they were still cutting away and that’s always the way I prefer to work. You’ve said you try and source at least one new instrument per project – was there something that was unique to this? Yeah, because of our work on “Going Clear,” I had used a lot of theremin and was quite inspired by that tonality, so especially when Alex started saying “haunted house,” we approached it with the Ondes Martenot, which is basically a 1920s French synthesizer that you control the velocity with your left hand, and with your right hand, you put a little ring around your finger and you slide up and down the scale. Ultimately, it sounds like a very precise theremin, so we used that and it’s a very organic way of manipulating electronics, [which] seemed to work very well for Elizabeth. There’s also a lot of weird choral stuff. I work with my producer Lucy [Alper], who is also a great singer, and she did some vocals on the cues and I would do weird, granular sampling to them and make them sound otherworldly without making them sound too dark. It’s an unusual choice, and certainly for the stuff I’ve done with Alex, it was a departure, but it worked. More than any other film we’ve done together, this one is very thematic and in the past, we’ve leaned more on the sonic palette to change tone and atmosphere, but this was more like conventional film scoring [in that] there are four or five very strong themes that develop and change. Since I saw this in parallel with “The Sound of Silence” at Sundance, it seemed as though you might be able to be more abstract in your narrative work than nonfiction. Is there anything to that? Will Bates: Yeah, I certainly think with “The Sound of Silence” that was the case. I found myself writing these big themes and then almost take a sledgehammer to them and tear them apart to their most basic minimal form. That just seems to really work for [the central] character anyway. There’s more opportunities in narrative to feature music [because in documentaries] there’s a lot of information that has to be explained and you’re helping to tell quite a complex story and a lot of dialogue, so I do find myself having to be wary of that and stay out of the way to some extent. How did “Sound of Silence” come about? We talked a lot about influences and Peter’s sense of musicality is so sophisticated that it was really about trying to find a world that really spoke to him and it was all about deconstructing these quite complex harmonic passages and saying the most with the least. [Michael and I] talked a lot about early electronic music and opera and even jazz and there are so many influences in that score, it was a really fun journey to find that sound. I remember hearing Michael and Ben saying they were doing extensive research into keys just to figure out the character of Peter and they had written the sound design into the film as if it were its own character – did they pass any of that pass down to you? Very much so. Yeah, we talked about how [the film would really blur the lines between the fine line where you can’t decide whether something is score and something is sound design. Sound is such an important of what [Peter] does and who he is. There were certain passages that I had to be mindful of what key I was in and we talked a lot about the calm of G major and the banality of C minor. [laughs] I never thought of my music in those terms before, having to be wary of what key I’m in and then having a conversation with the sound designer [because they] had certain elements that existed in their sound design palette that I had to be in the same key as them. It was fun. It may be inadvertent, but there’s a certain jangly sound – a metallic commingling harmony that still feels disjointed – that I can remember in “The Path” and was present in “Sound of Silence” that felt to me like something of a signature Is that something you’ve developed over the years? Yeah, that’s funny. “The Path” was only the second show I ever worked on and having come off “The Magician,” which is such a fantastic first introduction into the world of TV scoring, it was much more organic. That was a very specific sound for that and the exploring that I did to work on that show changed the music I did an the way I approach writing now. Scoring that show was almost performance-based — I’d have the picture up onscreen and kept everything off the grid and mic’d up the amps and play against what I was watching and hoped that it worked. [laughs] So there are a few toys I got along the way with that show that I incorporated into my quiver. You’ve been moving seamlessly between film and television. Has it been interesting to oversee a number of different projects at the same time? I think I’ve always been quite good at multitasking. When I was back in bands and whatnot, I’d always have more than one thing going on at once, so I’ve trained for this moment. [laughs] I also spent a lot of time in my early days scoring commercials and because of that training, I got very good at being fast and making decisions quickly, getting a brief in the morning and knowing it’d have to go out in the afternoon. I’ve always made my choices quickly and sometimes if things take a little bit too long, I know I have certain tricks that are up my sleeve after years of experience that I can use to get my decision making going for the next place. But some of the projects that I have now, they’re definitely different and I can’t believe the stuff I was doing in the past. Like when I was doing season three of “The Path” and I was still mic’ing up the amps, [I thought] “wow, I can’t believe I’m still doing this” because that kind of thing is so time-consuming and very difficult to recall. But working on a weekly deadline, I’ve got kind of faster ways of doing things these days as a result and I have a much larger studio [now] that’s allowed me to have different rigs for different projects, which is really useful. Was it a natural transition initially to film scoring, attaching a narrative meaning to music? Yeah, it’s always been in the background. When I was a kid, it was a dream when I realized John Williams wrote all those soundtracks, and when I was six or seven, it just blew my mind that one person could be responsible for all those incredible scenes that we all love. From that moment, I was like, “That’s what I want to do.” But of course, along the way you get distracted. I was in bands for quite a long time and I went from being a jazz musician to then writing a lot of electronic music and then always feeling like there was something missing. I thought maybe it was lyrics, so I started a singer/songwriter thing and did that for a while and then a band in New York. Then I started Fall on Your Sword and in a way, that was what got me closer to the dream of scoring movies [because] we would play live shows with FOYS and I’d always have these projections — I’d make these kind of ridiculously intricate, edited films that would be triggered from samplers – in the back and every show was kind of a comment on the visuals. So I’ve always had that distraction of what music can do to the moving image and the power that it has over it. So [composing] was a pretty easy transition. In a way, I wish I had done it sooner. I feel like I’ve been playing catch-up since then. “The Inventor: Out for Blood in Silicon Valley” will begin airing on HBO and HBO Go on March 18th at 6 pm. SXSW '19 Review: The Hills are Alive with the Sound of Laughter in Ninian Doff's "Boyz in the Wood"